The list below is constantly updated with the most recent ocean view properties for sale. There are many great neighborhoods on Oahu that have a prevalance of ocean view homes, and this category of real estate is one that we are passionate about. Some Oahu neighborhoods have view channel easements that ensure your ocean views will remain in place forever, while others have no such deed restrictions in place. One such luxury ocean view Oahu community with view channel easements is Hawaii Loa Ridge. 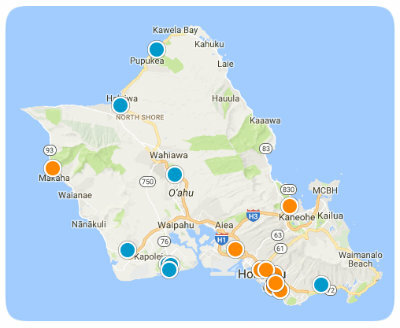 CLICK HERE to see the latest Hawaii Loa Ridge listings. A thorough real estate advisor can help you research (or may know from past experience) if there are any CC&R's in place that preserve your view plane, or can educate you on maximum building height restrictions so you can accurately anticipate what may happen to your coastline view. Please call Orion Barels for great service if you are considering the purchase of an ocean view home or whitewater view property on Oahu.